On Tuesday July 10, 2012, the US National Transportation Safety Board released its report on the July 2010 oil spill near Marshall, Michigan on a pipeline operated by Enbridge. The rupture leaked an estimated 20,083 barrels of crude oil (3,193 cubic metres) onto surrounding wetlands and drained into Talmadge Creek and the Kalamazoo River. Debbie Hersman, chair of the NTSB, criticized Enbridge for its failure to adequately respond to the environmental catastrophe. With costs exceeding $767 million, this event is now the most expensive onshore oil spill in US history. US regulators recently fined the company $3.7 million. As my previous research on the history of oil pipeline spills in Alberta from the 1970s to 2005 and from 2006 to 2012 has shown, oil pipeline spills seem to occur with significant frequency and in substantial volumes. The same is true for the rest of Canada’s oil pipeline network outside the borders of Alberta. Since 1959, all interprovincial and international oil pipelines in Canada have fallen under the regulatory authority of the National Energy Board, an independent federal agency established by the government of Prime Minister John Diefenbaker. 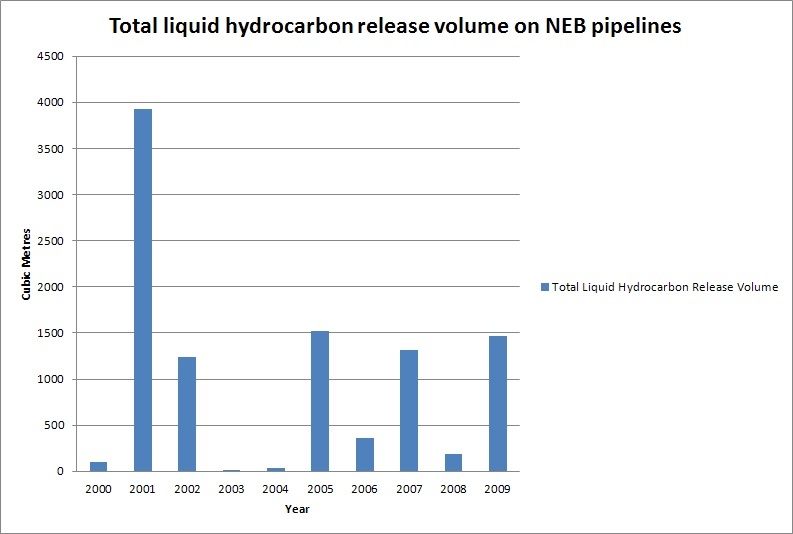 As of 2009, the NEB regulated the operations of over 70,000 kilometres of liquid hydrocarbon and gas pipelines, including the Canadian sections of the pipeline that ruptured near Marshall, Michigan in 2010, once known as the Interprovincial Pipeline. The history of the Interprovincial Pipeline is directly tied to the history of Enbridge. Enbridge was first incorporated in 1949 as the Interprovincial Pipeline Company in the wake of the discovery of conventional crude oil resources in Leduc, Alberta. The company completed the first segment of this expansive transcontinental pipeline, carrying crude oil from Edmonton to Superior, Wisconsin in 1950. It was “an historic occasion,” according to Tommy Douglas, Premier of Saskatchewan and father of Canada’s much-beloved public medical insurance system, when he opened the valve at the Regina pump station on October 23, 1950, inaugurating the first flow of crude oil from Alberta to Saskatchewan. He heralded the moment as a great benefit for Saskatchewan to have access to low-cost, affordable oil to fuel his province’s postwar economic growth. Just three years later, the federal government approved the extension of the Interprovincial Pipeline to link Superior, Wisconsin with Sarnia, Ontario in order to avoid the need to ship oil across the Great Lakes on tankers to reach refineries in Central Canada. This extension ran south of the Great Lakes through the US, including the state of Michigan, the same pipeline that ruptured in July 2010. The construction of the Interprovincial Pipeline and its extension to Sarnia in the 1950s was critical to the development of the oil industry in Alberta. This massive pipeline project, along with the completion of the Trans-Mountain Pipeline from Edmonton to Vancouver in 1953, opened most of the major Canadian urban markets for Alberta oil producers. Within just a few year’s time, this rapid pipeline construction linked nearly all of urban Canada to Alberta’s oil resources with very little public expression of concern over the potential environmental hazards. Canada’s luck seemed to run out by the mid-1970s as the Interprovincial Pipeline began to show its age. Various catastrophic ruptures plagued the pipeline as oil spilled across Western Canada and parts of the US. For example, in 1973 an estimated 30,952 barrels of oil (4,921 cubic metres) was released from a breach along the Interprovincial Pipeline in Minnesota outside of Grand Rapids. In early 1974, Strome, Alberta suffered a relatively smaller spill of up to 4,164 barrels of crude oil (662 cubic metres). Alberta Environment Minister Bill Yurko expressed his concern by January 1975, following seventeen particularly leaky months along the Interprovincial Pipeline which saw roughly 119,047 barrels (18,927 cubic metres) of crude spill on Alberta and Minnesota soil. Such spills persisted into the late 1970s, as was the case in August 1979 when roughly 4,761 barrels of oil (757 cubic metres) spilled across part of northwestern Minnesota. The National Energy Board threatened to shutdown a ninety-three kilometre section of the Interprovincial Pipeline Company’s number three line in the Edmonton area after it ruptured five times since 1969, including a 10,000 barrel light crude oil spill (1,590 cubic metres) at Sherwood Park in July 1979. Spills along the Interprovincial Pipeline persisted into the 1980s and 1990s. For example, in March 1988, farmers near St. Eustache, Quebec noticed the acrid smell of gasoline in the air as oil leaked from a nearby pipeline, part of the extension of the Interprovincial Pipeline to Montreal completed in 1976. Minnesota was struck once again by one of the largest oil spills on the Interprovincial in 1991, when 40,500 barrels of crude (6,439 cubic metres) leaked from a ruptured pipeline near Grand Rapids. The history of Canada’s interprovincial and international oil pipelines in the first decade of the twenty-first century, continues to demonstrate that a spill-free transportation system is elusive. 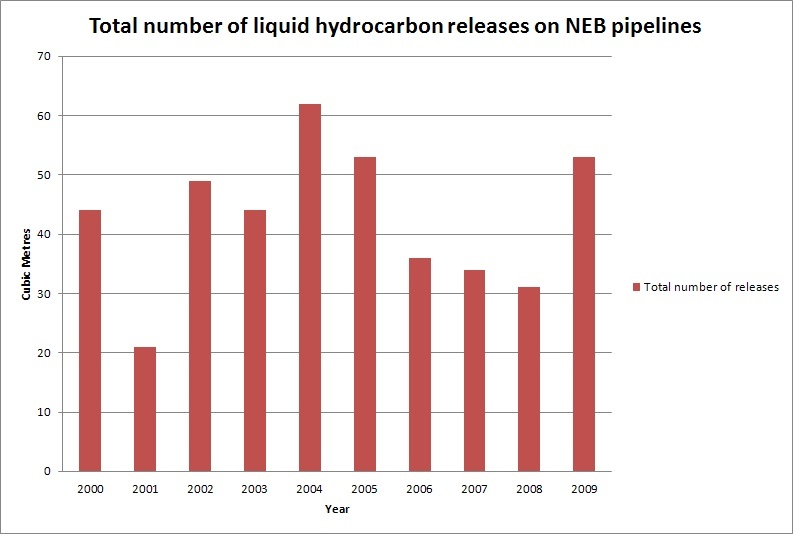 NEB data on pipeline releases of liquid hydrocarbons on Canadian soil between 2000 and 2009 record 427 separate spills along the system. This resulted in a total spill volume of 63,930 barrels of liquid hydrocarbons (10,164 cubic metres). The primary cause of spills on the NEB-regulated system between 1991 and 2009 was corrosion. Enbridge’s own Corporate Social Responsibility Reports also show the persistence of oil pipeline leaks along the company’s extensive system. Between 2006 and 2010, Enbridge pipelines spilled, leaked, and released 65,047 barrels of liquid hydrocarbons (10,342 cubic metres) along a network that spiders across the continent. Since the mid-twentieth century, there have been hundreds of ruptures, leaks, and spills of hundreds of thousands of barrels of oil along the pipeline network in northern North America. Canadians and Americans must consider this history of oil pipeline spills when assessing the environmental risks associated with the expansion of the continental network through new projects, including the Northern Gateway and Keystone XL pipelines. If oil spills are historically endemic to the industry, then communities along proposed pipeline routes need to carefully weigh the potential environmental hazards associated with such spills, including threats to drinking water, wildlife habitat, fisheries, and agricultural land. The Gazette, 1 April 1988, A4. Why has nobody left a reply on this article in almost a year and a half since it was published? Great work Sean! I commend you on your research and please continue to do this important work. Virtual high five! I get most of my responses on earlier articles that I wrote on this topic. Thanks for your encouragement and stay tuned for new articles soon.